For a vendor relationship to be long-lasting and effective, both sides should be able to identify when there are potential issues, communicate directly and address them in a timely manner. “Cyber thieves know that third parties often are a great one-stop shop for corporate clients’ information,” Karen Hornbeck, senior manager at Consilio, said during a recent webinar (recording available here) hosted by The Cybersecurity Law Report. Therefore, any mature data security program requires systematic and thorough oversight, clear leadership, the right tools to find gaps and efficient and appropriate action when issues are found. 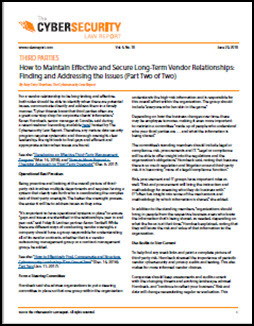 Read more about How to Maintain Effective and Secure Long-Term Vendor Relationships in Part 2 of this series from The Cybersecurity Law Report. This article was originally published on June 27, 2018.